Firewood has always been a source for a beautiful, crackling fire that provides warmth and enjoyment at a fairly low cost! Firewood has also been a source of frustration for many people. Smoky fires with wood that doesn’t burn; along with a messy pile of bug-collecting wood in your yard has caused many people to look for better solutions. 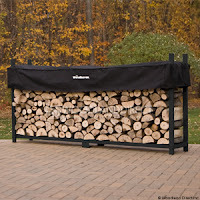 There is a solution - use a high quality firewood rack. Seasoning firewood refers to simply allowing the warm sun and natural air flow to dry out the wood. Seasoned firewood is more efficient and clean, producing less smoke and more heat in your fireplace. Freshly cut firewood has high moisture content. The moisture produces smoke and makes the wood hard to burn. The heat generated by the fire must be used to evaporate all that water before the wood fibers can burn. This creates a smoky dead fire, which is not fun for anyone. Instead, let natural air flow and the sunshine of spring and summer remove the moisture for you. A firewood rack keeps your firewood off of the ground and allows the air to properly flow through the wood. The ground holds a lot of moisture, and that is why you want to keep it elevated. Elevating wood off the ground also keeps bugs from inhabiting your wood pile. An elevation of at least a couple of inches is recommended. Spring is a great time to get started storing your firewood, as it takes 3-6 months to properly season firewood. Should I Cover My Firewood Rack? As mentioned earlier, fresh cut firewood has high moisture content. It is very important that the firewood be seasoned and dried out. Covering your firewood completely keeps the moisture in, and encourages mildew and mold buildup. Cross ventilation in your firewood rack is necessary for proper curing. After your wood has been seasoned, firewood rack covers can help keep the rain and snow off your firewood. Top only covers are a great solution. They keep the top portion of wood dry while still allowing ventilation into the rest of the firewood. Full covers work well in extreme weather conditions. Again, these covers should be used in the burning season after the firewood has been properly cured. “Cord” of Wood: Generally two stacks of firewood measuring 4 feet high x 4 feet deep x 8 feet long. “Face Cord” of Wood: Generally one stack of firewood measuring 4 feet high x 8 feet long. Length of Firewood: Firewood is generally cut in 18” to 24” links. It is best to measure the inside of your woodstove or fireplace to determine the right size firewood for your situation.